Heat oil in a large skillet over medium flame. Sear tofu until lightly browned, about 3 minutes. Turn, add in the bell peppers and cook until crisp-tender, about 3 minutes more. 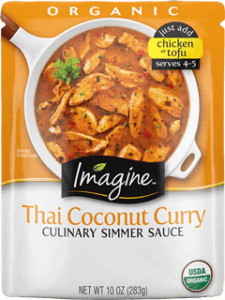 Add in the edamame and Imagine® Thai Coconut Curry Simmer Sauce. Lower the fire and cook until heated through, about 4 minutes. Serve hot with a rice side dish.